The other day I was walking into my house, and forgot to turn off the burglar alarm. My mind was elsewhere, so by the time I realized that I’d neglected to shut it off at the panel, the sirens were screaming. I quickly entered in the code and stopped the noise, and aside from two very freaked out dogs, there was no residual damage. But it got me thinking…home alarms center around one thing: Trust. We worry about the safety of ourselves and our homes and trust this machine will warn us if we’re vulnerable to harm. I wish the rest of the world worked this way…because every time I turn around, it seems someone else is violating our collective trust…especially in the dental industry. Yes, yet another unlicensed dentist is now facing jail time for misleading patients and defrauding both insurance companies and taxpayers, this time to the tune of $2 million and each count against him carries a maximum sentence of 10 years in prison. According to an article in Dentistry Today, Luis Omar Vargas was convicted of one count of healthcare fraud and one count of conspiracy to commit healthcare fraud. He also was charged with one count of conspiracy to violate the Anti-Kickback Statute. Vargas was also found guilty of defrauding taxpayer-funded health insurance plans by posing as a licensed dentist (which he obviously was not). Vargas provided small kickbacks to these patients and then turned around billed Medicare and insurance companies for a fortune behind the scenes. Of course, it’s a disheartening story for the majority of dentists who work to build an honest and thriving practice. But, you need to realize something. It’s not just dentists who will find out about this crime; it’s also patients. Good, hard-working people who are simply looking for a trustworthy doctor to treat them and their families will see stories like these…stories we see more and more of everyday…and will lose a degree of faith in the dental profession as a whole. Just like a burglar alarm, potential patients’ own internal alarms go off every time they see these kinds of stories pop up in the media. They realize they need to work harder to ensure their healthcare professionals are trustworthy and truly have their best interests at heart. So, How Do I Establish Trust In The Eyes of Patients? In this day and age, there’s no better way to demonstrate that you’re a hardworking professional worthy of a family’s trust and business than leveraging the “Google My Business” and Review platform. Google, which is now considered the most trustworthy media on the planet, gives members of a community an unbiased platform to express opinions on local service providers. And when other people in the community go to look for and then vet a service provider, such as a dentist or doctor, the first stop is always Google. If you aren’t leveraging Google’s business platform, you are losing ground to other docs in your community. And going a step further, the more positive, 5-star reviews you and your office have, the more phone calls and visits you’ll receive, plain and simple. 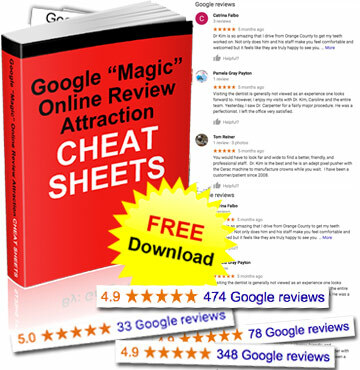 Google’s business and reviews platform have a massive advantage over other advertising and marketing options for one simple reason: you own them. I’ll explain. Let’s say you drop a few thousand bucks on a direct mail campaign to local neighborhoods. Once those mailers go out, you may get a few calls, and maybe even some clients. But then, it’s over. And until you send another mailer, you have no ongoing contact with these potential patients. And going even a step further, there’s a big difference between sending a piece of advertising that says, “I’m the best dentist in town,” and 100 unprompted patients gushing, “He’s the best dentist in town” in an unbiased, trusted forum. This is a phenomenon called “social proof”, and its value completely crushes other methods of exposure. Help “disarm” the trust worries of patients in your community by learning how to effectively implement a robust, repeatable Google review system for your office. The benefits will continue to pay off for years to come. It’s time you invest your time and effort (which isn’t nearly as much as you think) with a platform that can result in a windfall of new Pay/Stay/Refer patients. Category Local Search Tips | Tag corporate dentistry, Dental Marketing, dental practice, dental practice fraud, dentist marketing, google dental practice, Google Local Search, google reviews, google reviews dental practice | Bookmark the permalink.